To see the birds rise in the morning, I need to be paying attention before sunrise, which was around 7:15 on January 31st, the day I made this log. 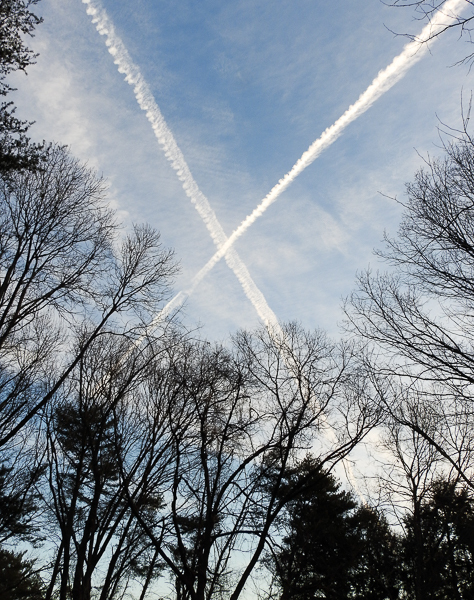 (Sunrise gets a few minutes earlier each day as the winter slowly moves toward spring.) If I watch from a window in a darkened room, it can be a struggle to make out the little forms I see hopping around out in the yard near the feeders, so some mornings I very quietly go outside with my first cup of coffee and sit on the back step, where a bench serves as a bit of a blind to make the birds feel more comfortable my presence. There, I can see more of what is going on, although there are some birds that are more skittish when I’m there, hanging back until I go inside. 6:55 Male Northern Cardinals on two feeders. Carolina Wren singing somewhere near, another further off. 6:56 More Northern Cardinals plus Dark-Eyed Juncos and White-Throated Sparrows at and under the feeders. 7:04 Most birds are on the ground eating spread millet or under feeders or in leaf litter with a couple of the Northern Cardinals on feeders. 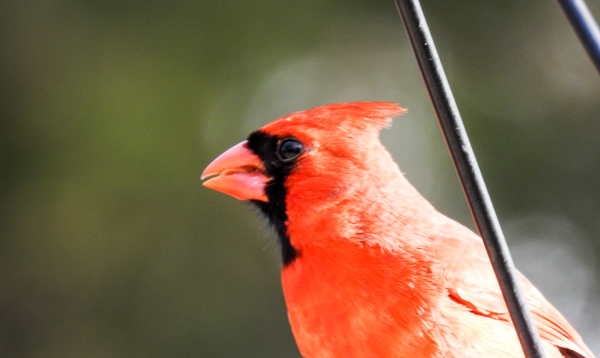 The cardinals are always among the first and last birds at our feeders each day year round. If I peer out of my kitchen window while I fill the coffee pot, I can almost always make out at least a pair of them at the feeders. They will eat from feeders, but I think they are really ground feeding birds at heart. Still, the freshest food is usually in the feeders rather than spilled on the ground, so they start the day up in the feeders. As more cardinals arrive, they spread out over the ground under the feeders as well. Later, when the Mourning Doves descend in large numbers, the cardinals get gently pushed back, retreating to the ground and to the wisteria tangle to wait them out. Two other reliably early and late birds this time of year are the White-Throated Sparrows and the Northern Juncos. Usually one or two of each will show up within a few minutes of the cardinals. Within half an hour, there will be at least a dozen and a half of each, hopping around in the brush-pile and picking up the millet I’ve thrown on the ground in that area. 7:05 Hear American Crows in distance. 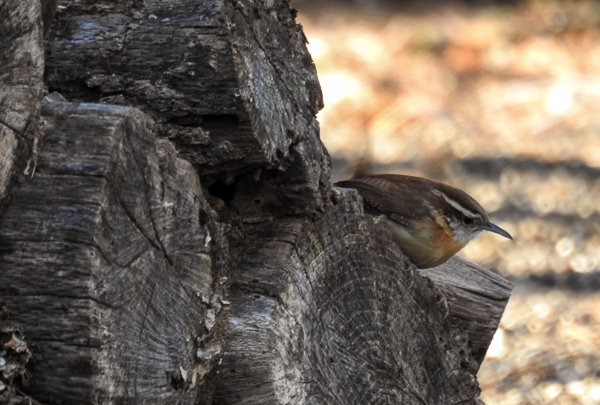 Carolina Wren now on the brush pile. 7:07 Quivering calls of Dark-Eyed Juncos. Crow flies past cawing. First of the squirrels arrives at the squirrel feeder and birds move away from that area. 7:11 Carolina Wren on garage roof. Dark-Eyed Juncos and White-Throated Sparrows in brush pile and ground near it. The Carolina Wrens take a little longer to make an appearance at the feeders but they are usually the first birds I hear each day, at least partially because their song is among the loudest (and my hearing is not the best), but still, the males sing very early each day and all year round. Sometimes if you listen closely, you can hear the buzzy sound of a female counterpart to the male’s song. The cardinals chips are softer but audible if you are sitting outside. 7:16 Birds nervous and retreat to wisteria. Orange cat appears on brush pile. I chase him away. Our neighborhood has a mix of house cats that roam free and feral cats. “Orange” seems to be a feral who has claimed our yard. He knows I don’t want him around the feeders but he’ll sneak in to hunt if he thinks I’m not watching. He also likes chasing squirrels but today he seems to be after birds which puts him on my bad side. 7:18 Birds begin to return. Carolina Wren calls from top of brush pile. Second Carolina Wren singing somewhere in yard. 7:21 Tufted Titmouse lands in wisteria tangle, then snags seed from feeder. Goes up on sycamore tree branch to eat it. 7:24 Brown Creeper on sycamore trunk. Nuthatch talking somewhere nearby. 7:26 Carolina Chickadee snags a seed from feeder. Most of the regular birds in the yard are used to me, so they quickly settle back in once I’ve chased Orange off and returned to the step. 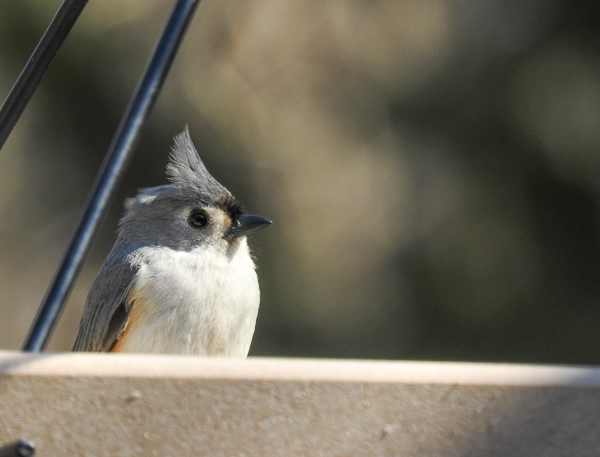 The Tufted Titmouses and the Carolina Chickadees typically show up not long after the sun is up. Their similar style at the feeders (grab a seed quickly and then retreat to a branch to eat or to hide it) makes them pretty unobtrusive to the other birds at the feeders, although a little later in the day, the House Finches can be pretty aggressive toward other birds who dare to go for sunflower hearts in the Squirrel-Buster Plus feeders that they favor. The Brown Creeper is a very irregular visitor that I might not have seen from the house window, so she was exciting to see working her way up the sycamore tree where some of the feeders hang. 7:27 First American Goldfinch arrives in sycamore tree, eyeing the Squirrel Buster feeder. 7:29 A few more Dark-Eyed Juncos arriving. 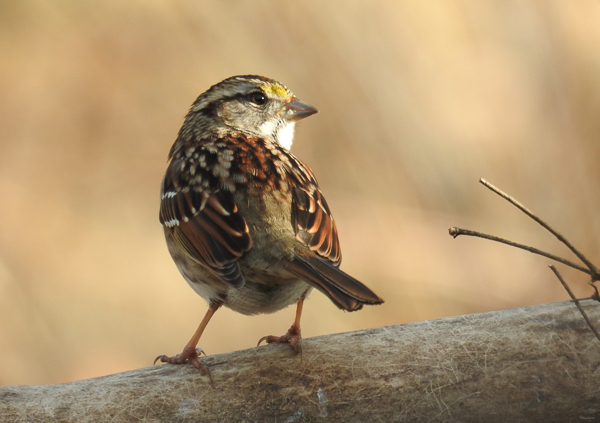 A White-Throated Sparrows in far platform feeder. 7:31 Brown Creeper is now over on side tree near garage. 7:32 Male Northern Cardinal back in feeders. We have a fairly large flock of American Goldfinches who enjoy the Nyjer feeders on the other side of the house, but early in the morning, just after sun rise, we’ll usually get a handful to a dozen or more of them eating the sunflower hearts on this side of the house and sipping water from the birdbath. When there are too many for the ports in the feeder to accommodate, they drop from a branch in the tree to a feeder port and take a seed, only to be displaced by another bird quickly after. 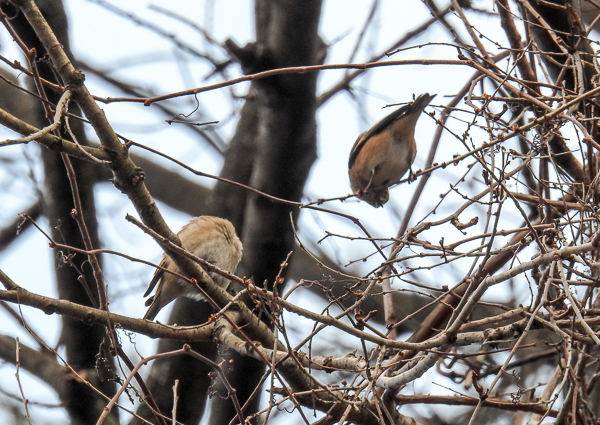 They don’t bicker nearly as much as the House Finches though. The Dark-Eyed Juncos and White-Throated Sparrows spend almost all of their feeding time on the ground but there is one White-Throated Sparrow who will get into one of the raised platform feeders every now and then and one Dark-Eyed Junco who will sometimes sneak a sunflower heart from the Squirrel Buster Plus feeder. 7:33 Cooper’s Hawk makes unsuccessful run at brush pile then moves to branch in side yard. Birds remain active. 7:36 Cooper’s Hawk still on branch. Five American Goldfinches on feeder. 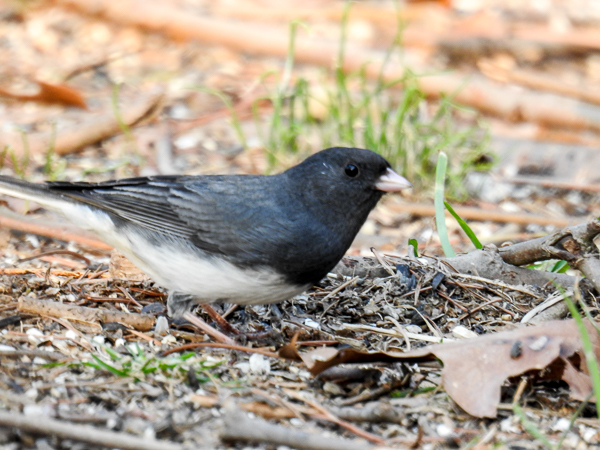 Dark-Eyed Juncos and White-Throated Sparrows on ground and Northern Cardinals in feeders. For the past several weeks, a Cooper’s Hawk has settled into the yard, to the Mourning Dove’s dismay. Mourning Dove seems to be her favorite food. In the past, when we’ve had hawks in the yard, they land in a tree after an unsuccessful run at the birds and if you walk toward the tree, they fly off and out of the yard. This bird is particularly bold and as long as she is high in the tree, she doesn’t seem particularly bothered by people. Instead of flying off after failing to snag a bird like most hawks I’ve seen do in the past, this one will settle in for long periods of time on a branch high up, waiting for another chance. Also in the past, when there has been a hawk around, the feeders would empty out for long periods of time, sometimes hours, but now the smaller birds often will settle back into the the feeders fairly quickly, although today the goldfinches have not yet gone back to the nyjer feeders near the branch in the side yard where the Cooper’s currently sits. I’m speculating that this hawk favors the bigger birds which may be why the smaller ones seem just a little less skittish after a fly-by. 7:41 White-Breasted Nuthatch appears. 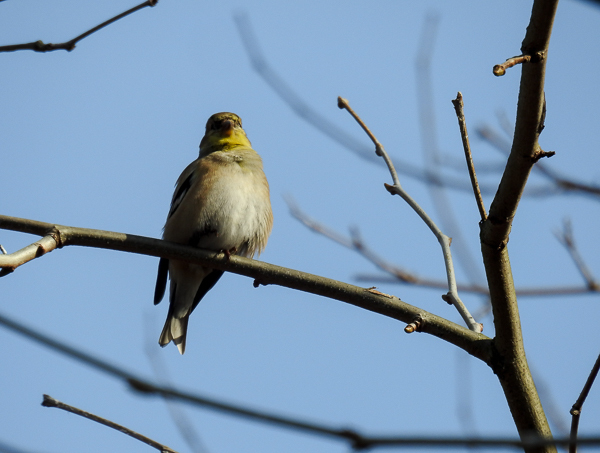 More American Goldfinches arrive; seem to be eating something on vines in tree by garage. A few Mourning Doves high up in trees by garage. 7:43 Jim comes outside and leaves for work. I pop inside to get camera. 7:45 Carolina Wren eating dried worms in feeder. Blue Jays call but don’t appear. 7:47 Four seagulls fly past. Hawk still on branch. 7:52 Twenty-two American Goldfinches in vine tree near garage. Cooper’s Hawk still in on branch near their nyjer feeders at other end of house. 7:54 Still a handful of Dark-Eyed Juncos and White-Throated Sparrows very close to brush-pile on ground. 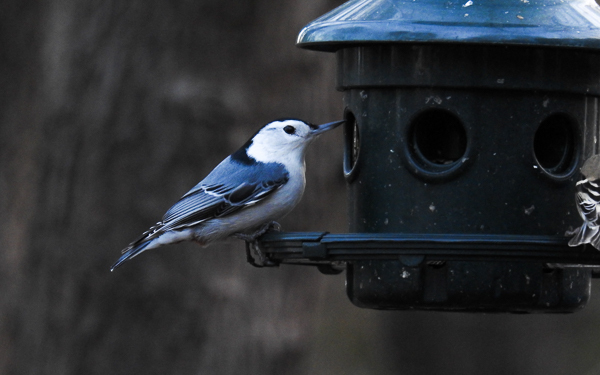 The White-Breasted Nuthatch is a daily visitor, usually one at a time, although occasionally two. They never seem to among the first birds of the day, typically showing up a little later and usually during periods when the feeders are full and busy. I didn’t see this winter’s Red-Breasted Nuthatch today and he’s been a bit scarce for the past several weeks. The Blue Jays don’t usually come by this early in the day. 8:00 Feet and hands cold. I go inside to warm up and now watch from house windows. 8:10 Downy Woodpecker now on suet feeder next to back door where I was so recently sitting. American Goldfinches on Squirrel-Buster Plus feeder. 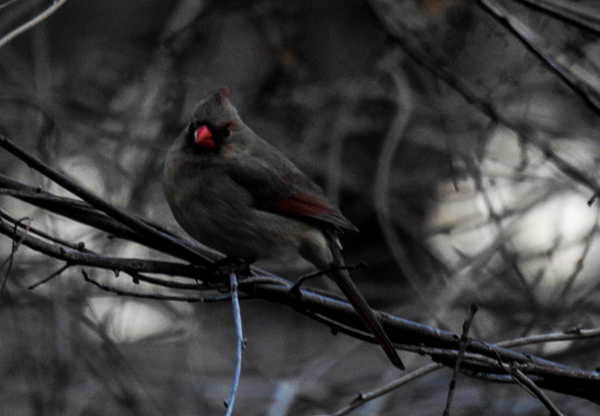 Dark-Eyed Juncos, White-Throated Sparrows and a Northern Cardinal underneath. Goldfinches now on nyjer feeders. Hawk still on branch but looking over now that thirty-two Mourning Doves have arrived at feeders (now that I’m inside.) First House Finch arrives at feeder. 8:16 Three European Starlings check out the feeders. 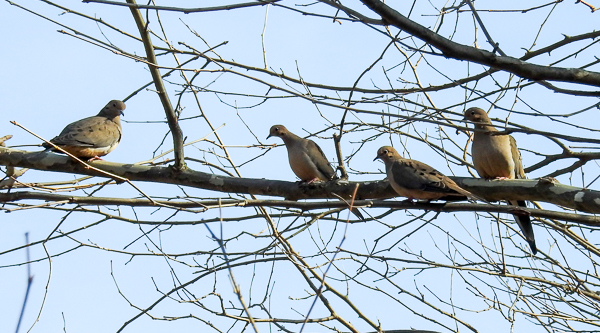 More Mourning Doves arrive, bringing their number to about fifty. Cooper’s Hawk flies through and everyone scatters. Northern Cardinals immediately return to feeders the doves have vacated. 8:21 Dark-Eyed Juncos and White-Throated Sparrows still in and around brush pile. Most staying close to the pile, but some venture out further and get a drink from the birdbath. Not sure where hawk is now but since unsuccessful, probably still sitting on a branch somewhere in the yard. The American Goldfinches have abandoned the njyer feeders again. Mourning Doves have not returned. 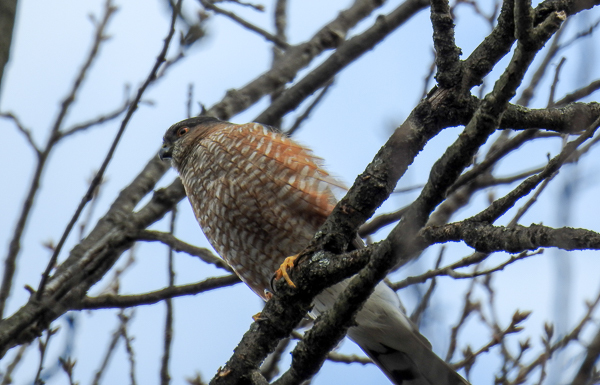 The Cooper’s Hawk has changed the routine of the yard in some ways. The Mourning Doves in particular are usually regulars, arriving in ridiculously large groups, but with the hawk hunting, they aren’t around as much and don’t stay as long. The sun is fully up and the birds’ day is now well along. The feeders will go through cycles of busy, almost frantic bird activity, followed by some or all of them getting spooked and not a single bird at the feeders. Over and over until sometime after five o’clock, the sun will go down and a little while later the last stragglers will go off to sleep for the night, just to do it all over again tomorrow. I really enjoy your birding blog. The photos you post with it are wonderful. You’re so lucky to have such a wide variety of birds visiting your feeders. I have a small yard and and not many trees so I get mostly goldfinches & house finches at my feeder. Thanks for sharing! Thanks Jeanne. I’m glad you are enjoying my posts. : ) If you’d like to bring in more birds, think about the things they need: food and water and cover. Even if there isn’t more room for trees, a brush pile and/or some thick bushes can provide cover and nesting spots. (Wrens, juncos and sparrows love my brush pile.) 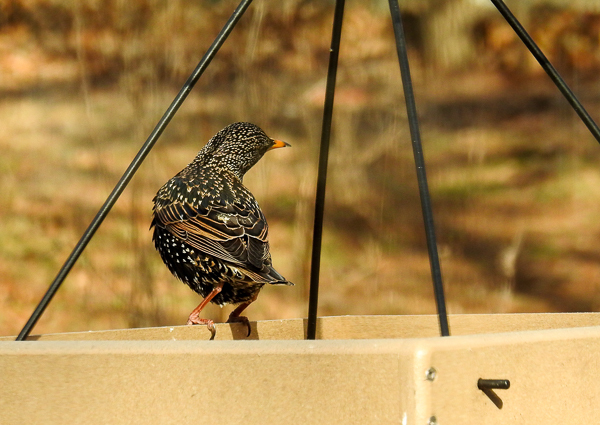 A warm birdbath in the winter can draw in all kinds of birds when temperatures drop — even birds that won’t come to feeders. My yard is about an acre and has a lot of trees and is frankly a bit on the wild side. (We leave a lot of dead branches which pleases the woodpeckers.) In the warm months when the leaves are out, there is lots of cover but in the winter, it’s more open. My brush piles help there, but I want to plant some evergreen bushes this spring . . .